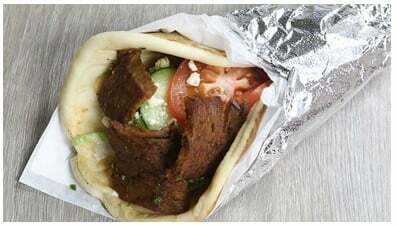 Lamb & Beef Gyro, wrapped with lettuce, tomatoes, onions, cucumbers, feta cheese, and traditional tzatziki sauce, in warm Greek flat bread. 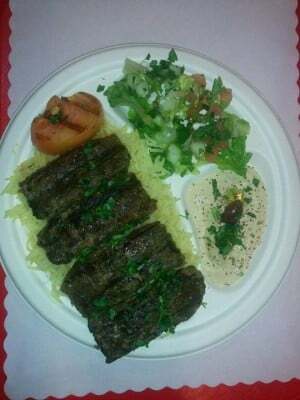 Marinated, tender fire-grilled chicken shawarma slices served with rice, hummus, pita bread, garlic sauce, and salad. 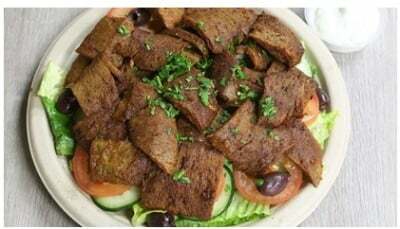 Gyro meat slices served over lettuce, tomatoes, onions, cucumbers, feta cheese, olive oil, all tossed in a Mediterranean vinaigrette. 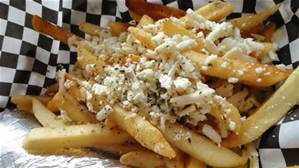 Fries with Garlic sauce and Feta Cheese.